About Us – PC Systems of Missouri, Inc.
Our low key, no pressure approach is still what makes us unique in this industry. Our employees are knowledgeable, patient, and SALARIED. This means that there are no commissions, and you don’t have to worry about them draining your wallet to make a quota. 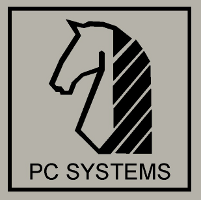 PC Systems of Mo., Inc. I started college at Washington University here in St. Louis in 1982. I was originally studying medicine but switched to computers my first year. The IBM PC had just been released and Wash U was one of the first places to get them. I took some data-entry jobs to help put myself through school. Software in those days was even more user-unfriendly than it is now. One day I complained to one of my bosses that if he gave me two weeks, I could write a better program than the one we were using for data entry. Much to my surprise, he took me up on it. Soon I was writing programs on a regular basis. By the time my senior year rolled around, I had three of my classmates working for me and the business had become a full time occupation. I wrote several packages for the real estate market and began to offer turnkey solutions to clients. This meant that I needed to provide computers with my programs. At first I bought the computers locally but I found it difficult to get support from the local companies. Eventually I began buying from PC Systems out of Florida. I liked their ads and their support policies were fantastic. In September of 1987, I realized that I had sold over $100,000 of equipment out of my apartment so far that year. 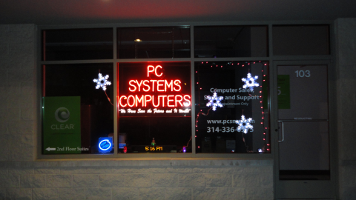 PC Systems had mentioned that they were interested in expanding their operations in their newsletter so I called them and asked them if they would be interested in having a store here in St. Louis. They said, “Yes!” I flew down to Florida over Thanksgiving that year to meet everyone face to face and learn more about their operation. Stewart and I hit it off right away. They had several stores going by that time but the St. Louis location was going to be the only one in the Mid-West. We came to a very equitable agreement early in December of that year. Stewart would provide the inventory. I would provide the labor. We would split profits fifty-fifty. January 1988 was a blur. I found the location. Had it fixed up a little and began selling and servicing computers. Business was good. Our staff grew little by little. Our business grew by bounds. After five years, I bought Stewart out. It took three years to pay off the franchise. It took less than two years to pay off the bank. Life is good. Computers are a great field to be working in. It’s wonderful to be paid for your hobby. It’s nice to be able to make a good living helping people. We custom build computers. We service just about any brand of PC compatible. I get paid to play with all the latest toys! Naturally, the hours are insane but have you ever heard of a successful computer company that did not burn the midnight oil? Like I said, Life is good. Who would have believed that computers would ever become this inexpensive? We have witnessed a lot of changes in the last eleven years. Some of them have been part of a normal progression. Others have been a complete surprise. I never expected the big guys to take a page from our play book and start building custom computers with quality components. Then again, I never expected some of these companies to become big players! Anyhow, I’ve recently decided that the only way for us to remain competitive is to once again seek the shelter of a larger organization. 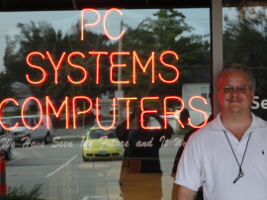 On November 16th, PC Systems of Missouri merged with Solvent Systems. I’ve also decided that I’m not cut out for paperwork! Management tasks have been consuming too much of my time. I’d rather be out in the field fixing problems or writing software. Our merger with Solvent Systems is designed to free up my time and allow me to concentrate on the work I enjoy. A friend once told me that the problem with working for yourself is that you will never be able to work for someone else again. That may be part of it. Sometimes it just makes sense to be small. Several times in my professional career I have sought the shelter of a larger organization. Each time it has been much more costly than I anticipated. Anyhow, concentrating on service has been a good idea. That part of the business has grown tremendously. Now, in the interest of both fun and sanity (not to mention profit), it is time to reorganize. So here we go again. On October 31st PC Systems and Solvent Systems parted amicably. Once more into the breach, dear friends. Speaking of friends, I have found several other small computer professionals who I can call on to help me shoulder the load. We’ll fill in for each other from time to time or when a particular person’s expertise is called for. That way I’ll still be able to take some time off and enjoy life a little. I may even get around to writing that novel…. I’m going to continue to concentrate on service, spend a little time on the management tasks and continue to expand into new markets. We’re all geared up to handle a large variety of computer needs (new machines, repairs, upgrades, networking, Internet hosting, programming, etc.). Playing with the latest toys continues to be a lot of fun. Solving problems continues to be extremely rewarding.